Aline Marie Fernandes is currently a MPA scientific associate at the Applied Nano-Optics Group of the Life Sciences Department. Over the past 10 years she has been working on stem cell biology and cell therapy. Aline has been one of the principle scientists of a project funded by CAPES, a Brazilian ministerial agency for scientific funding, that started in 2014 thereby establishing a collaboration between the biophysics institute of the Federal University of Rio de Janeiro (UFRJ) and the Applied Nano-Optics group at the INL. Her current research focuses on the design and optical characterization of liposomal formulations for applications in nanomedicine. Aline Marie obtained a BSc degree in Chemistry (2001), followed by a MSc degree in Biotechnology (2004) and subsequently obtained a PhD degree in Morphological Science (2009). She has been involved in the conception and implementation of several student courses related to pluripotent stem cells at UFRJ. Recently, she organized the first biophysics postdoctoral workshop at UFRJ. 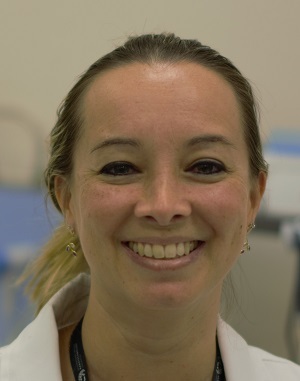 Aline Marie has contributed to six peer reviewed articles, participated in the writing and execution of several >1m$ national scientific projects and has a strong participation track-record in national as well as international conferences. LOPES DE ASSIS, JULIANE; GROBAS, IAGO L.; PEREIRA SIGNORETTI, PAULA VIEGAS; MARIE FERNANDES, ALINE; CARVALHO MIRANDA, MARIA ADELAIDE; SILVA, BRUNO F.B. ; FELIPPE VALVERDE, RAFAEL HOSPODAR; EINICKER-LAMAS, MARCELO; DE BEULE, PIETER A.A.
LIPOPLEXES FOR GENE DELIVERY CHARACTERIZED BY FLUORESCENCE CORRELATION SPECTROSCOPY. BIOPHYSICAL JOURNAL (PRINT), V. 110, P. 489A-490A, 2016. BEIRAL, HELLEN J. V.; RODRIGUES-FERREIRA, CLARA; FERNANDES, ALINE MARIE; GONSALEZ, SABRINA R.; MORTARI, NICOLI C.; TAKIYA, CHRISTINA M.; SORENSON, MARTHA M.; FIGUEIREDO-FREITAS, CÍCERO; GALINA, ANTONIO; VIEYRA, ADALBERTO. THE IMPACT OF STEM CELLS ON ELECTRON FLUXES, PROTON TRANSLOCATION, AND ATP SYNTHESIS IN KIDNEY MITOCHONDRIA AFTER ISCHEMIA/REPERFUSION. CELL TRANSPLANTATION , V. 23, P. 207-220, 2014. MARQUES, SUELEN ADRIANI; ALMEIDA, FERNANDA MARTINS; FERNANDES, ALINE MARIE; DOS SANTOS SOUZA, CLEIDE; CADILHE, DANIEL VELOSO; REHEN, STEVENS KASTRUP; MARTINEZ, ANA MARIA BLANCO. PREDIFFERENTIATED EMBRYONIC STEM CELLS PROMOTE FUNCTIONAL RECOVERY AFTER SPINAL CORD COMPRESSIVE INJURY. BRAIN RESEARCH , P. 00-00, 2010. FERNANDES, A. M.; MELETTI, T.; GUIMARÃES, R.; STELLING, M.P. ; MARINHO, P. A. N.; VALADÃO, A.S.; REHEN, S.K. WORLDWIDE SURVEY OF PUBLISHED PROCEDURES TO CULTURE HUMAN EMBRYONIC STEM CELLS. CELL TRANSPLANTATION , V. 19, P. 509-523, 2010. MARINHO, PAULO A. N.; FERNANDES, A. M.; CRUZ, JULIANA C.; REHEN, STEVENS K.; CASTILHO, LEDA R.
MAINTENANCE OF PLURIPOTENCY IN MOUSE EMBRYONIC STEM CELLS CULTIVATED IN STIRRED MICROCARRIER CULTURES. BIOTECHNOLOGY PROGRESS (PRINT) , P. N/A-N/A, 2009.